All items for shops, including food, furniture and accessories. For filling the shelves in your shop, see our Packets and Tins category. Fish Preparation Board in Half Scale / 1:24th. Image taken next to a 5p coin for reference. Wicker Basket with Handle, filled with Coxs Apples straight from the orchard. White wicker basket with two handles, filled with fresh, rip Braeburn apples, straight from the orchard. 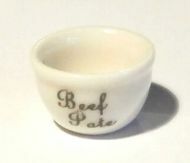 Empty White China Basin with the word "Beef Pate" on the side. 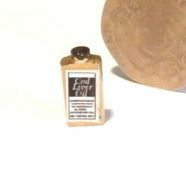 A Wartime Bottle of Cod LIver Oil, as used through WW11 and beyond. A Box of Cherry Toothpaste. An early Box of Dettol Disinfectant. A Shop Box of Prunes, suitable for any grocers or green grocers. © 2016 Gail and Aileen Tucker T/as Merry Gourmet Miniatures - All rights reserved.